Challenge #2 for the Peachy Keen "Let's Face it Fridays" was to create a project with our muse in mind. I'm sure many of you consider your children as your creative muse, as I do. My beautiful daughter posed for these pictures last winter and I was happy to finally get around to getting these pictures on a scrapbook page. 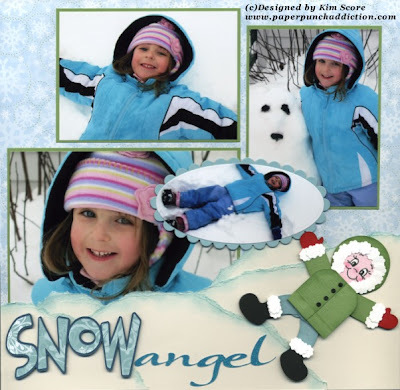 Below are the step by step instructions to make the little snow angel girl. Want to win some Peachy Keen stamps? Hop on over to the challenge site and play along with the challenge. 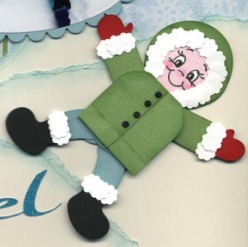 The prize for the winner of the challenge is "Winter Faces" PK-521 and the new "Snow Cuties" PK-501 stamp sets! Be sure to also check out the other awesome projects by the DT members. Die cut 2 Build-a-Bear in baja breeze. (follow assembly instructions for jointed girl). For jacket, cut the large tag in half and round out sharp corners to create jacket sleeves. Glue sleeves onto arms. Glue mittens onto hands. Attach arms to body with mini brads. Attach boots to legs with dimensionals. Attach legs to body with mini brads. Glue small tags together to create jacket (lay on top of body to determine width). Round out sharp corners at top. Cut a 1/4" wide strip for the bottom of the jacket. Sponge edges of all wild wasabi pieces with garden green ink. Attach jacket to body with dimensionals (position dimensionals so that it doesn't prevent the jointed arms from moving). Glue 1 3/4" circle onto head. Glue face onto hood. Glue fur trim pieces onto hood and cuffs. Punch small circles with crop-a-dile for buttons on jacket. I love it when I get a new idea for an old punch. Who knew a build a bear could become a snow angel? AMAZING LO! I love it! How darling!! What cardstock color did you use for the face? Thank you for the tips and techniques. Love the 'Snow Angel'. You did a great job.